Sir Thomas Erpingham, of Erpingham in Norfolk, is most famous as the commander of Henry V's archers at Agincourt. His role in Norwich's affairs was also an important one, however. A member of the local gentry and a faithful servant of the house of Lancaster since his youth (accompanying Bolingbroke on military expeditions and into exile, commanding the ambush that captured Richard II, and subsequently urging Henry IV to have Richard executed), he was called on by the Norwich authorities on various occasions to assist them in their dealings with the Lancastrian kings. In 1400 for example, when he held the office of king's chamberlain, his advice was sought by the city on some matter, presumably either related to the effort to have the new king approve the existing city charters, or the wish to move beyond that towards a new constitution; whichever, he was asked to put in a good word for the city to the king. For this he was paid £13.6.8d, and when his wife came to the city she was given a gift of wine, oats, capons and swans. He may even have initiated the consultations with civic authorities, in efforts to turn the city against the Bishop of Norwich, Henry Depenser, who sympathized with the deposed Richard II and became implicated (perhaps unjustly) in a rebellion against Henry IV; the house of Despenser had a long-standing enmity with the House of Lancaster. The city assembly was persuaded to endorse Erpingham's list of accusations against the bishop. Erpingham's further advice and influence at court, his success in winning Norwich's backing against Despenser, together with a large loan made to the king by the city in 1402, were factors in Norwich's success in winning from Henry IV its important charter of 1404, which brought about the desired constitutional changes, included substituting a mayor for bailiffs; certainly he received gifts of wine from the city at that time. Interestingly, a man of the same name  conceivably a relative  was given the post of mace-bearer to the city's first mayor; perhaps this was another sign of the city's gratitude. With the bishop temporarily disgraced, Erpingham had become even more influential in Norfolk. Between 1409 and 1411 Sir Thomas was also involved  through advice, influence, and loan of money  in obtaining for the city a grant from the king of the jurisdiction over alnage of worsted cloth. In 1414 he was called on to arbitrate a very divisive constitutional crisis in Norwich and, after his return from the French war, cemented the settlement he had helped broker by using his influence (he then being steward of the king's household) to obtain a royal charter embodying the new constitution. As late as 1420/21 he was being rewarded with wine for his counsel, in this case with regard to how the city should handle a visit by the king. His concern for city affairs may have been because of family connections. William Hudson ["Norwich Militia in the Fourteenth Century," Norfolk Archaeology, vol.14 (1901), 302] believed that his father was John Erpingham (bailiff 1352/53 and 1360/61, died 1370), himself the son of Sir Robert Erpingham. Much of the rebuilding of the Dominican friary in Norwich was financed by him and his son Robert, who became a friar there. The family arms were set between each of the clerestory windows of the friary church, and may still be seen there today. 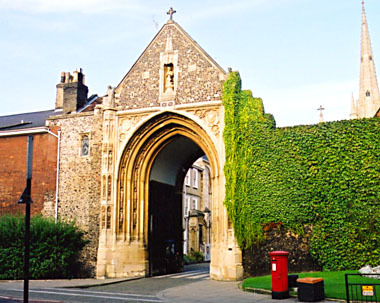 The gate that bears his name, one of three surviving gateways leading into the cathedral close  in this case on the route leading directly to the main entrance to the cathedral  is thought to have been built at his cost, a gift to the cathedral, ca.1420. 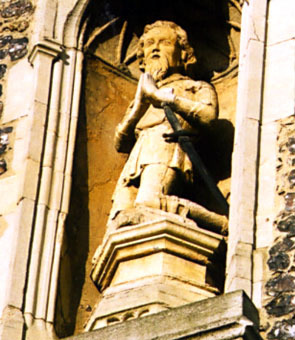 The upper portion, surrounding the canopy within which Sir Thomas's statue is recessed, is faced with flint in Norfolk style (although it is not certain if this was the original facing). Below it, surrounding the Perpendicular arch, the outward face of the gateway is highly decorated with figures of saints. 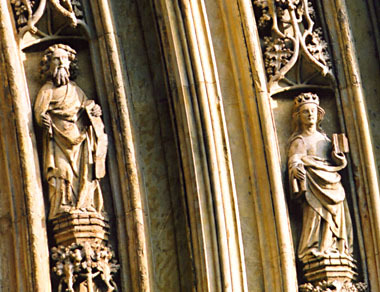 The turrets on thebuttresses at either side also bear sculptures, as well as the heraldic devices of Erpingham and the families of his two wives, and each turret is topped by the statue of a priest. The word yenk ("think") is engraved at various places on the gateway, and is a request for viewers to remember (and say a prayer for) the donor. The mouldings around the arch contain a series of 14 female saints in the outer moulding and 12 male saints in the inner. The pedestals of some of the figures emerge from exquisitely carved foliage. The date of the building of the gate is not known for certain, but it must have taken place after his second marriage (1411). The style suggests the 1420s, and it seems likely the gate would have been given at a time when Erpingham's thoughts were turning to his death and afterlife  by this time he would have been in his sixties (he was born in 1357). There are stories that he built the gate as a penance for a sin he had committed  different versions suggest a homicide, his role in the disgrace of Bishop Despenser, or support of heretics  or in gratitude for surviving Agincourt, but there is no real foundation for any of these (although his opposition to the bishop was real enough). If anything, the highly decorated gate is an assertion of orthodoxy at a time when Lollardy was posing a challenge to the established order and at a time when the believed sponsor might have been concerned with his spiritual future. Erpingham died in 1428 and was buried inside Norwich cathedral, in a tomb built in advance, alongside his two wives; a chantry was established there in his name. His testament did not forget the city in whose affairs he had always shown an interest. He left sums of money to the cathedral and the Prior and monks there, as well as to the church of St. Martin at Palace; his armour too he left to the cathedral. He also bequeathed £6.13s.4d each to the sisters and poor inmates of St. Giles' hospital, Bishopgate, and to the same of Normanspitel, and lesser sums to prisoners in the gaols of Norwich castle and the city guildhall, as well as to hermits within the city. The construction of the gate may have been an act intended to win favour from the cathedral in which he hoped to be buried, to win favour from God, and to establish a memorial to himself. The armour in which he is depicted may have been that which was bequeathed to the cathedral. Although his will makes no reference to the gate, it is possible he commissioned it shortly before his death, with the work finished posthumously by his executors, or it may even have been entirely a project of his executors. His testament focused on pious and charitable bequests and left the rest of his worldly goods to his executors' disposition  they may have felt the gateway a suitable application of that wealth, and certainly it has stood the test of time. It has been argued that his statue is not the right size for its niche and may have been moved there from his tomb, replacing some other statue on a religious theme.